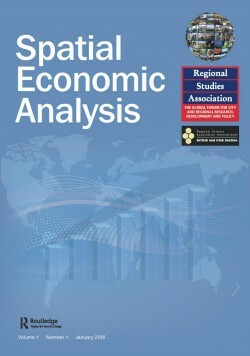 Spatial Economic Analysis is a pioneering economics journal dedicated to the development of theory and methods in spatial economics, published by two of the world's leading learned societies in the analysis of spatial economics, the Regional Science Association International - British and Irish Section and the Regional Studies Association. A spatial perspective has become increasingly relevant to our understanding of economic phenomena, both on the global scale and at the scale of cities and regions. The growth in international trade, the opening up of emerging markets, the restructuring of the world economy along regional lines, and overall strategic and political significance of globalization, have re-emphasised the importance of geographical analysis. Spatial variations in economic development within cities and regions are also highly topical subjects for intellectual enquiry and have long been the focus of policy initiatives by national, regional and local governments. The awakening emphasis on space among economists has been stimulated by the emergence of a new breed of theory, namely ’new economic geography’or ’geographical economics’. This new theory adds a significant new dimension to the already existing theoretical tools of spatial economics, which broadly aim to analyse the role of geography and location in economic phenomena. Additionally, spatial economic analysis is increasingly being supported by the emergence of new analytical methods, with an explosion of interest in new models and techniques of spatial data analysis and data visualisation (GIS). Spatial econometrics is becoming increasingly recognised as a valuable sub-discipline among mainstream econometricians. All articles in this journal have undergone rigorous peer review, based on initial editor screening and anonymized refereeing. Spatial Economic Analysis was launched in 2006. It has earned a Thomson Reuters Impact Factor for 2017 of 1.231. The current editor-in-chief is Professor Paul Elhorst of the Faculty of Economics and Business in the University of Groningen. He succeeded Prof Bernard Fingleton of the University of Cambridge, who guided the journal for the first ten years. The journal is published by Taylor and Francis and has four issues per year. More details are available at the journal's website here.